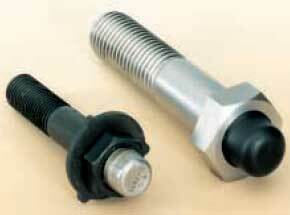 A modified bolt or stud that allows a specific tension to be accurately applied. Correct tension is easily checked using a fingerfeel device that is built in to each fastener. Extensively used for flange jointing duties in many industries including offshore, petrochemical, mining, defence and power generation. They prove particularly valuable where unreliability may have a cost, health and safety or environmental impact. • Each RotaBolt is calibrated to ensure the achievement of design load is accurately monitored. • RotaBolt system is far more reliable than torque wrench or hydraulic tensioner where bolt loads at end of tightening cycles are unknown and uncontrollable. • Easy to check fastener tension, even when wearing protective gloves or diving equipment. • Suits a wide range of bolting and environmental conditions. • Resists corrosion, elevated and cryogenic temperatures, shock and vibration. • Indicator for RotaBolt 2: Upper/lower settings as required. Standard range: M12 to M125 bolts, M18 to M125 studs. Materials: Alloy steels up to 12.9 strength grade, stainless steels, cupro nickel, nickel and titanium alloys. Other sizes and materials available. Customer-supplied fasteners can be modified.